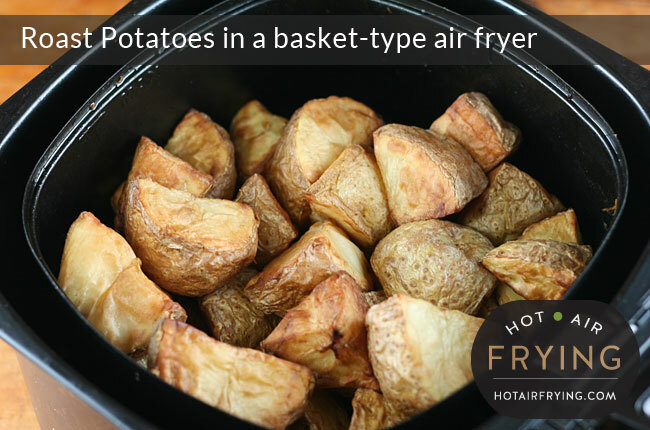 This is a recipe for making roast potatoes in a basket-type air fryer, using a Philips AirFryer™ as an example. 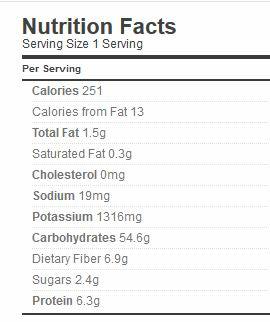 The maximum capacity of the average model Philips AirFryer is 1.25 kg (2 3/4 lbs) of raw potato, chunked. Let’s make a full batch: that’s enough for 4 people. Or for two people for two meals, providing leftovers for the next evening. There’s our 1.250 kg of potato all weighed out on the scales; that’s 6 medium potatoes. Anyway, as usual folks, let’s get the recipe out there, then we can dissect it later. Wash potato, peel, cut into large chunks, adding chunks to a large bowl. Cook (no need to pre-heat) at 160 C (320 F) for 25 minutes. 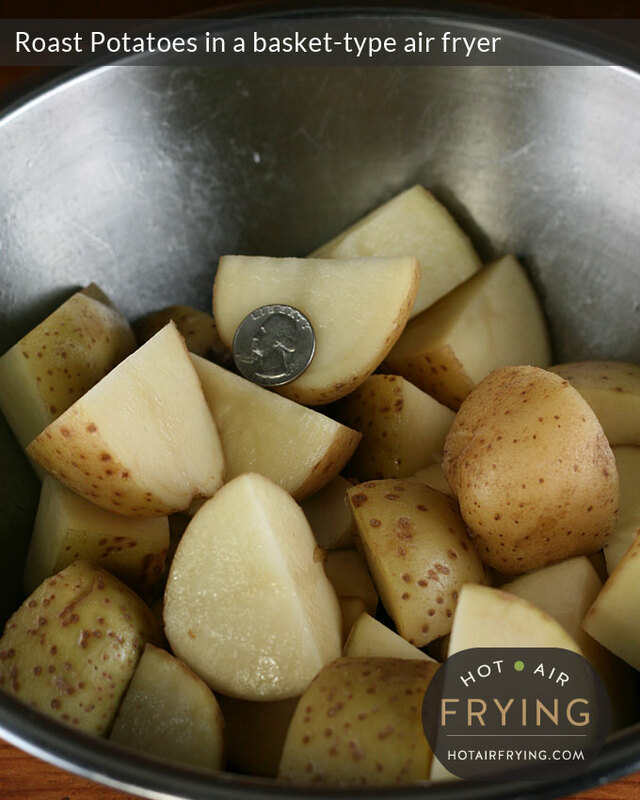 Take out the potatoes and tip them back into the bowl you have been using. Toss them in there briefly and gently using a large spoon. Transfer potato chunks back into fryer basket. Place back into machine, raise temperature on the machine to 180 C (350 F), and cook for another 7 minutes. Transfer potato chunks back into fryer basket. Leave temperature unchanged. Roast for a final 7 minutes. Serve piping hot. Best reheated in machine. 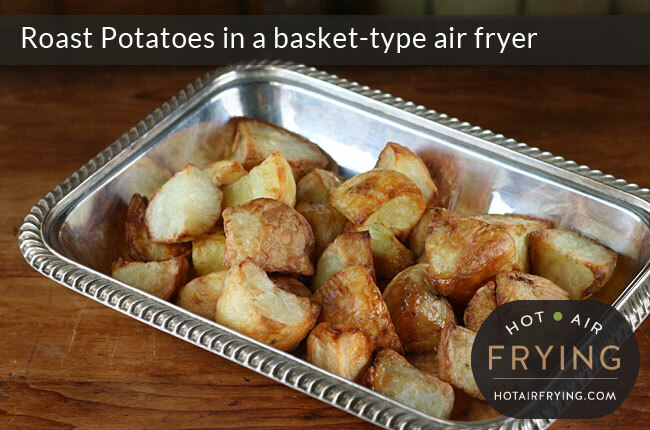 Leftovers are best reheated in the air fryer as well, to restore their crispness to them. Try about 3 to 4 minutes at 160 C (320 F). Which variety of potato works best? If you’re in the UK (or anywhere else) where you can get Desiree, King Edward or Maris Piper, try those. 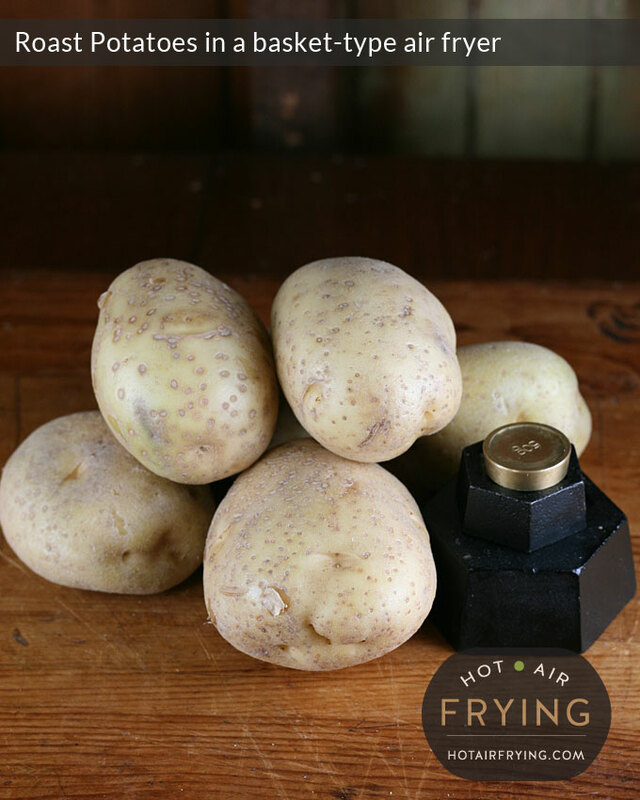 If you’re in North America where potatoes are just sold generically by the bag as “all-purpose table potatoes“, they will generally work just fine, but you may achieve the best and most reliable results with russets. In the photo below, the potato chunks are about the size you want for a good British-style roast potato; certainly no smaller. 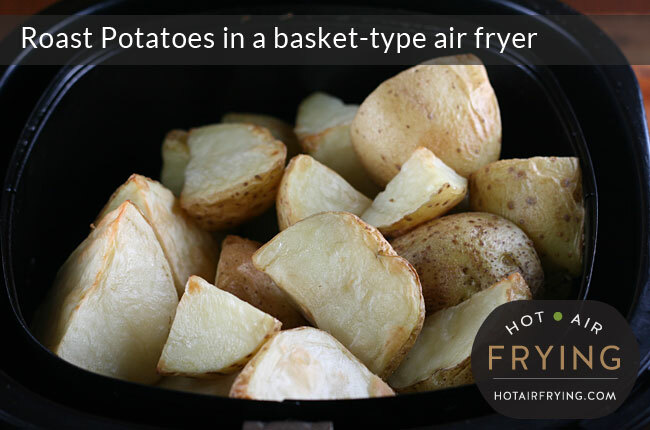 With a basket-type air fryer, you have to first toss your veggies in a separate bowl to coat them with oil. Since I’ve dirtied the bowl anyway, I tend to use it twice more to “retoss” the potatoes in at the two further stages of cooking where it’s needed. I can “air toss” straight from the basket in a pinch if there’s not too much in it, but if there’s a lot in it, the chances of something ending up on the floor are good. If you’re like me, and this is your first time out, you’re going to wonder why the three separate roasting steps. So I’m going to show you visually the progress at each step. The photo below shows after the first 20 minutes, still pretty bland looking. After this initial roast, and a toss, we raise the temperature to 180 C (350 F). The roasties after a total of 27 minutes. Above you see the roasties after 7 minutes. Nearly there but not quite. A toss, then back in for a final 7 minute blast. And there above we have the finished roast potatoes, after a total of 34 minutes. The cut sides are crispy, the sides with the skin left on them will of course be softer. The insides are nice and fluffy; the potatoes are quite moist overall. For best results, peel. 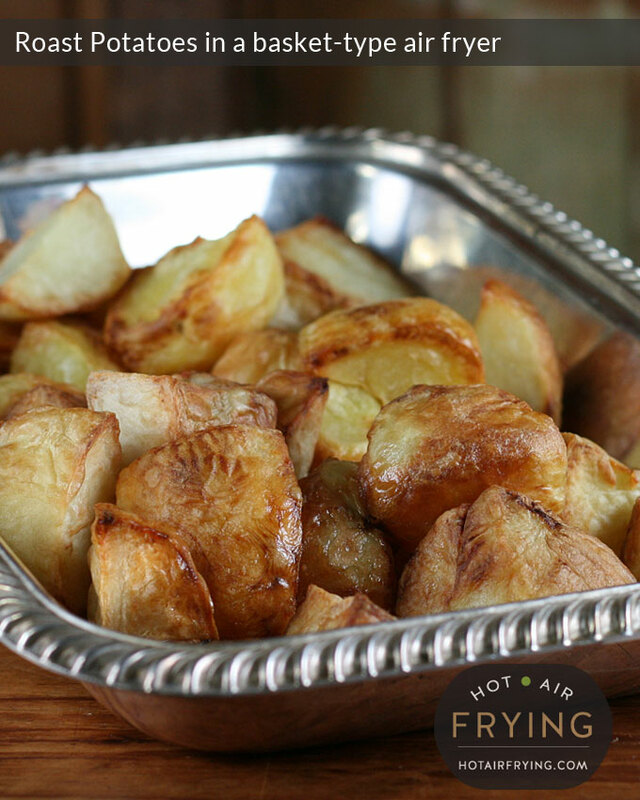 We’ve made them both ways peeled and unpeeled for several years now, and the jury is in: peel makes for softer roast potatoes and with some varieties it can make them come out even somewhat rubbery. Roast potatoes should be crisp or there is no point. You don’t need to waste the peel; assuming you have washed the potato first as you should, you can simmer and strain it, freezing the liquid as potato peel broth for soups. Then put the boiled peel into the compost or feed to livestock if you have any where you are. There, no waste. At some point, I’ll replace the photos of unpeeled potato on this page with peeled ones. 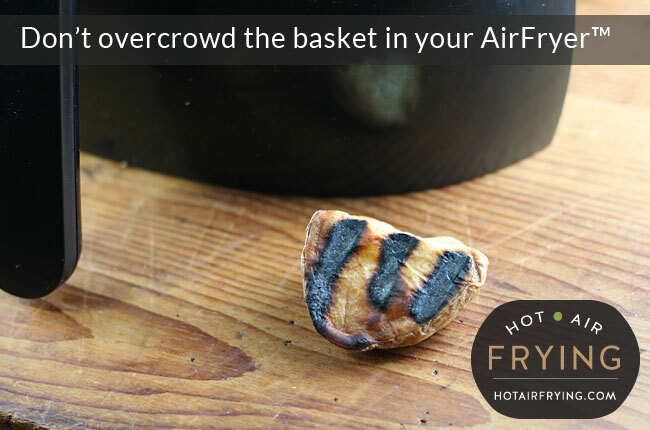 One minor world of caution: don’t overcrowd the basket as that may cause a potato or two to get rammed up against the top heating elements. Some of your dinner ends up looking like a Hanukkah dreidel piece with a Hebrew letter on it. Those top elements make burn marks into the food. Honest; I found out in the usual way, by having it happen to me. Tried this but par-boiled the potatoes first, skin on in Malaysia is not a terribly good idea as the potatoes even though Idaho suffer quite a lot from lesions which need to be cut out. Anyway the result was fabulous roast potatoes after the first 30 minutes and didn’t need to continue with the second and third stage. Many thanks for sharing. Oh really, a lot of lesions on the potato skins in Malaysia? Well you’d get crisper roasties from peeling them anyway, so there’s definitely a culinary argument to be made in favour of peeling them in that regard. Glad to hear they were good. Now you may wish to do an experiment of doing what you did but *without* parboiling the tatties first. BTW what fat / oil did you toss them in first? 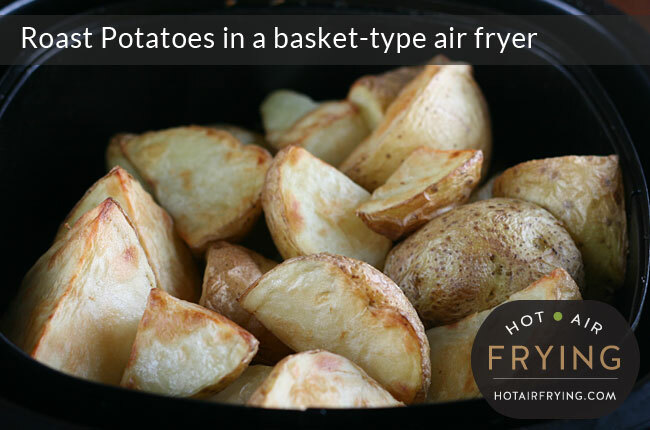 What model of airfryer do you have? Always peel the potatoes . which means a normal potato(not green) still contains toxins.So I think just to be on safe side, remove the peel. I love my air fryer. I had Yukon golds and cut them into fairly uniform pieces and they were raw. I will par boil them the next time. What was the procedure you followed, with timings? Who I used canola oil and it leaves a not so,nice taste. The spuds come out great but I was wondering which oil is best please?